Australian cypress pine species (sp. callitris glauca): Australian cypress is a conifer native to the eastern states of Australia. The distribution of Australian cypress is mostly in inland New South Wales and Southern Queensland. 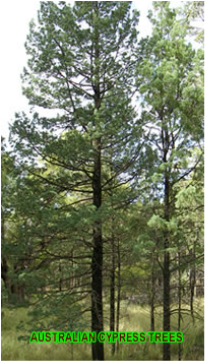 Australian cypress is logged on a sustainable basis as part of the Australian Government's Australian Farm Forestry Program. Australian cypress wood: Australian cypress is predominantly golden. However, variations in Australian Cypress color range from cream colored sapwood and yellow-gold to brown heartwood. Australian cypress has closed and tight grain with large and small knots. Australian cypress uses: The visual appeal of Australian cypress, its durability, density, nail holding ability, fire resistance, and termite resistance have made Australian cypress an attractive product in international markets, especially for flooring, feature finishes, and cabinetry. Australian cypress sourcing issues: We source our Australian Cypress Pine from sustainably managed forestry farms.